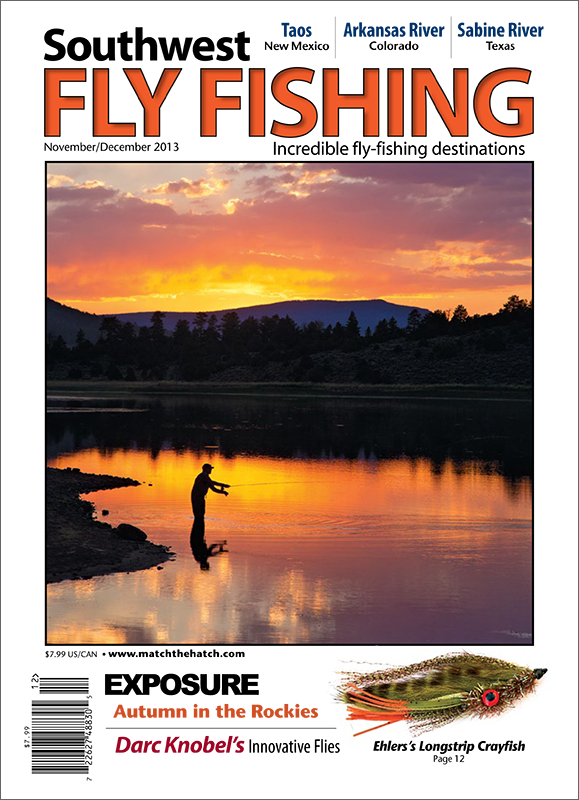 issue of Southwest Fly Fishing magazine. Cover courtesy of Southwest Fly Fishing. Cover photo by Ryan Bonneau. While the calendar proclaims that it’s merely midwinter, the air temperature strongly suggests otherwise. It’s only January and already, I find myself standing alongside a popular tailwater on what is expected to be the year’s first 80-degree day. Despite having relocated to the Phoenix metro area from the Midwest nearly 15 years ago, it still feels surreal. 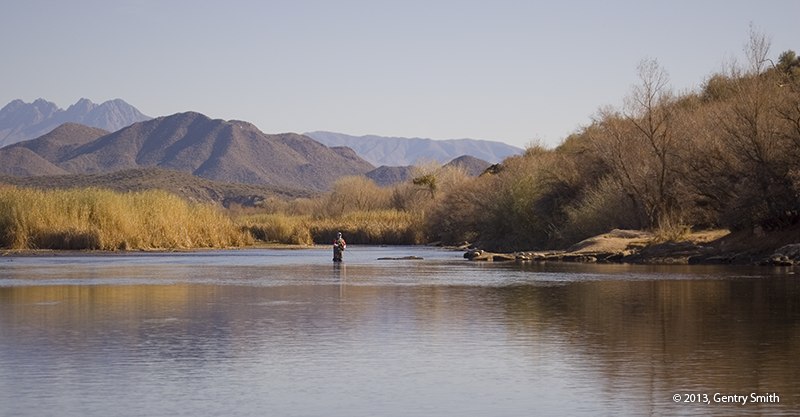 Not only can I fish at a time when I was once shoveling snow, I’m also immersed in the natural beauty of the surrounding Sonoran landscape: giant saguaro cacti and expansive mountain views define a sizable watershed that seasonally supports a healthy rainbow trout population in the Lower Salt River Recreation Area. 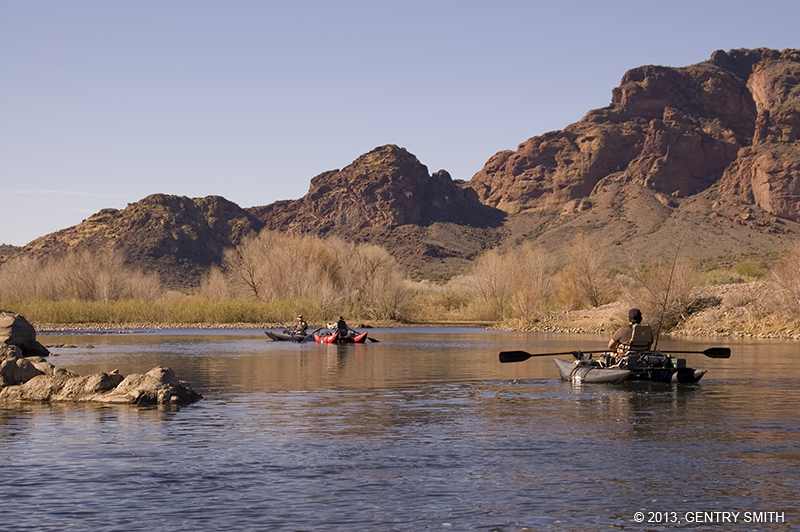 The Salt River supplies water, power, and aquatic recreation to the Phoenix Valley. Formed by the confluence of the White and Black Rivers in the high mountains of eastern Arizona, the Salt meanders southwesterly, picking up several tributaries along its course. Downstream, where the river enters the Tonto National Forest, it is contained by a series of four massive impoundments: Roosevelt Lake, Apache Lake, Canyon Lake, and Saguaro Lake, collectively known as the Salt River Project (SRP). Just below Saguaro Lake’s Stewart Mountain Dam, the Salt River enters the Lower Salt River Recreation Area. Because water released from the dam is only 52 to 54 degrees, this 11.5-mile stretch of river has the unusual distinction of being a cold-water fishery in the middle of a desert. Floating the river in a personal watercraft is a great way to escape the crowds and cover more water, but be sure to check the river’s flow rate beforehand to verify that it is safe. Although the Lower Salt River Recreation Area lies within the Tonto National Forest, its close proximity to the city of Mesa lends an almost urban feeling, especially in the scorching summer months, when the water is often overrun with coeds who come to inner-tube the river, replete with beer, boom boxes, and bikinis. However, from late fall through early spring, the river is almost exclusively occupied by anglers and other outdoor enthusiasts. During these cooler months, the Arizona Game and Fish Department (AZGFD) stocks catchable-size rainbow trout at varying locations. In early winter, when the SRP releases water from Bartlett Lake, the AZGFD stocks fish at the Phon D. Sutton and Granite Reef Recreation Areas, located adjacent to and below the Verde Confluence, respectively. As SRP waters resume normal flows from Stewart Mountain Dam in early spring, the AZGFD begins stockings at the Water Users access area and Blue Point Bridge Picnic Area. In addition to the seasonally planted rainbow trout, anglers may bring to hand bass, catfish, carp, and native suckers. When the rainbows are actively feeding, they will often readily take a variety of nymph patterns. However, angling pressure keeps these trout from being easy marks. Stripping baitfish imitations, such as Clouser Minnows, is a good bet for the Salt’s multiple bass species. Swinging Woolly Buggers and Simi Seal Leeches may result in a mixed catch of trout and bass. In the faster current, beadheads or added split shot may be necessary to keep flies on the bottom. 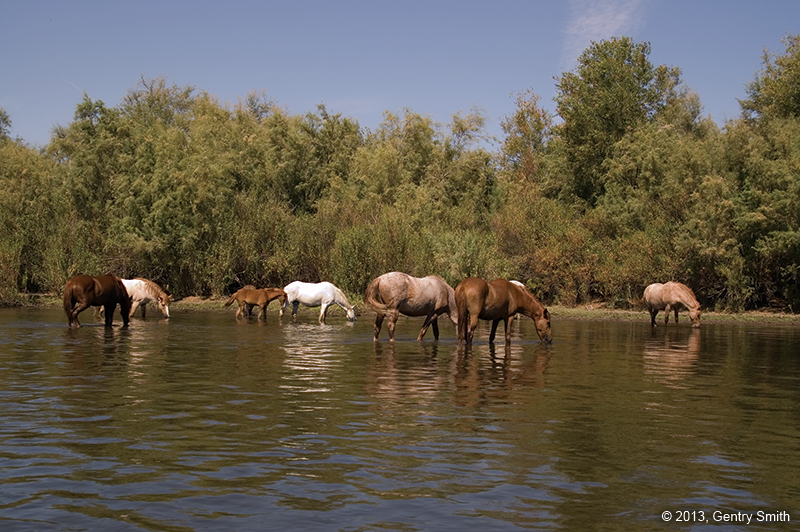 Wild horses evoke the river’s Wild West heritage. Most anglers park and fish near the Salt’s many paved lots. To find seclusion, follow the unmarked paths leading from the Bush Highway to the river’s edge. Floating the river in a personal watercraft is a great way to escape the crowds and cover more water, but be sure to check the river’s flow rate beforehand to verify that it is safe. Besides fishing, the area provides spectacular wildlife viewing: bald eagles and peregrine falcons nest nearby and soar overhead, bighorn sheep climb along the rocky cliffs, and, amazing to many anglers, wild horses evoke the river’s Wild West heritage. In addition to an Arizona fishing license with a trout stamp (check current regulations, as the trout stamp program may change for 2014) , anglers need a Tonto Pass for daily use of the designated recreation areas. Passes are available at most nearby convenience stores.